12/30/2018 03/04/2019 - by Liam Weisman - 4 Comments. 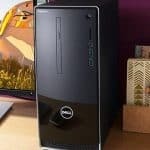 Just as other recently reviewed sub-$300 desktops, the Dell Inspiron 3668 desktop is a regular low-mid-tier desktop meant for home and office duties. It is meant for the casual user with regular tasks such as web browsing, daily computing tasks, media handling, and office related duties. The Dell Inspiron 3668 sports a simple design, nothing like the Alienware series gamers are used to. But it shines in its own subtle light. For the most part, it should be a gem for the modest at heart user looking for a budget desktop with an impressive performance. We recommend it as our sub $300 Editor’s Choice for budget-entry-level desktop use. Design-wise, the Dell Inspiron i3668-3106BLK-PUS strikes a good balance between style and restraint. The front chassis is made of polished matte black case that enshrouds a metal case within. Its edges are finished with silver lining running along its whole front section. Meanwhile, the embossed silver Dell logo sits close to the bottom of the face while a neat mesh-like assembly of vents adorns its south. Moving on, the side panels are both made of hard plastic with no vents are present (there is one at the rear) like as is common for some desktops we’ve reviewed in the past. I’m looking at the CyberPowerPC and iBuyPower desktops with see-through plexiglass side panels. Nonetheless, considering this Inspiron has no graphics card. As a result, there isn’t much heating that should cause worry so the rear vents are enough. Getting into the hood requires not much effort too. The rear has a few screws so you need a Phillip’s screwdriver, a little workman skill and a few minutes to get through. Inside, there isn’t much to look at either The arrangement is nothing special, in fact, a little bit disorganized but it’s put together for functionality (it’s bearable). Upgrading some extra components is easy as there is space for expansion. Cabling was clearly not their strong suit but at least you can get around to whatever you want easily. 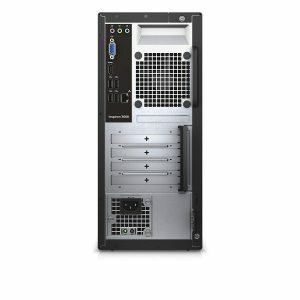 For storage, there is a single 2.5-inch hard drive and a 3.5-inch bay for expansion. Measuring at 11.93 x 6.06 x 13.9 inches and 13.39 pounds the Dell Inspiron i3668-3106BLK desktop is a pretty moderately sized PC. Compared to other towers we’ve seen, it takes on a smaller footprint. 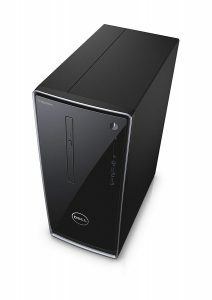 It shares a similar shoe size as the Dell Inspiron 13650-1551SLV desktop, but it has a trimmer compact small form factor size compared to the XPS Tower Special Edition PC (15.22 x 7.09 x 14.02 inches). 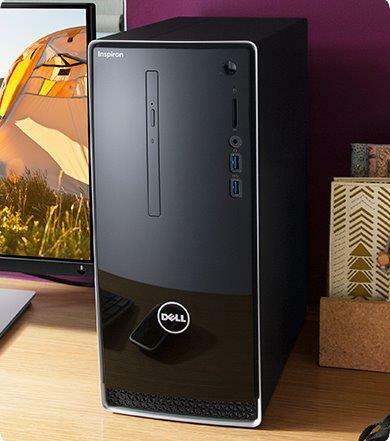 Dell managed to fit in a couple of ports in this PC, but I must say most of them are just the basic ones like everything about this entry-level desktop. The front section houses two USB 3.0 ports, a microphone jack, microSD slot, power button, and Optical DVD-RW Drive. Now, the microSD is a good touch to this computer and should help you load photos and video from your camera should the need to transfer arise. For the USB 3.0 ports, they are just as basic as the rest of the other components and should get you by without qualms. All ports considered, the USB 3.0 port is the one best option you get if you want to transfer data faster. Other connectivity options available the Bluetooth DW1707 card. At the current price point that the Dell Inspiron 3668 sells for, you will be hard pressed finding a PC with all the components and performance of your dreams. That’s because, at the sub-$300 price point, most PCs are entry-level and compact models. Consequently, they have more than a few compromises made to accommodate the low price. That said, the Dell Inspiron 3668 combines the best of components that should remain functional longer, up to five years at least. Speaking of components, the Dell Inspiron 3668 i3 packs the 7th Generation Intel i3-7100 Dual Core processor based on Kaby Lake architecture. The card is a predecessor of the Intel Core i3-6300 and builds on a few aspects. I’m looking at video decoder for 4K video technology, improved Speed Shift technology (that dynamically adjusts the CPU clock,) and support to Optane technology (which is a future kind of high-performance SSDs.) To clarify, that means it can handle some 4K content thrown its way and manage high-end futuristic SSD storage should you ever opt to upgrade in that direction. Still, on performance, the Inspiron 3668 handles itself well in multitasking tasks thanks to two cores and an 8GB DDR4 2400MHz memory. Typically, most entry-level desktops come with 4GB memory but the Dell Inspiron has double that which is excellent for Windows 10 systems and handling performance of its league. Also, like prevalent on most budget-entry PCs, 1TB HDD storage is the norm when it comes to storage. Our unit sports a 7200RPM HDD which for the most part is sufficient if you’re in the market for plenty of storage for your data files, movies, games and software. As far as gaming is concerned, there is no dedicated graphics card that comes with this unit. Only an integrated Intel HD Graphics 630 card is available meaning the PC is not capable of running modern triple-A gaming titles. Still, it should, however, run a couple of other low demanding games on medium and low settings if you really want to play. Check out this YouTube video on some of the games the Intel HD Graphics 630 card is capable of handling. One of the most defining aspects of the Dell Inspiron 3668 desktop is pricing. And the Dell Inspiron i3668-3106BLK-PUS definitely offers a great value package at that. But that couldn’t possibly be all. There are others, case and point, the components. For instance, the modern core i3-7100U processor, 8GB DDR4 memory and 1TB hard drive storage. Those make a name for the Inspiron 3668 and should be impressive at most casual tasks and 4K video playback. The only wrinkle, yes there is a wrinkle, is the lack of solid state drive and a more futuristic USB port like the USB Type-C. The SSD is to ensure fast booting up and fast saving and retrieval of data while the USB Type-C ensures fast data transfer way into the future. On other fronts, the case didn’t blow us way either with its subtle no-frills look. But the interior is simple and accessible and supportive of upgrading which kind of cancels that negative out. Altogether, the Dell Inspiron i3668-3106BLK-PUS manages to get our Editor’s Choice for its modest design, great low price, and performance. Usually, PCs at this price point are basically web browsers. So the Dell Inspiron strides ahead here. All things considered, it should serve you well. P/S If you’ve got some extra cash consider upgrading to SSD storage and you’ll be happier with the performance.